We’d love your help. Let us know what’s wrong with this preview of Imperium Lupi by Adam Browne. A decade has passed since the last Howler War and the City of Lupa stands peaceful again under the choking cloud of the Ashfall. The wild hyenas are conquered, the little beasts subdued, and the wolf packs preserve their uneasy oligarchy thanks to the noxious power of imperium. However, new threats fester within the Lupan Wall. There are those who would overturn the rule of the Den Fathers, if not the dominion of wolfkind altogether, by persuasion, murder, even genocide, if that’s what it takes. Imperium Lupi is a gritty, steampunk, fantasy adventure full of intrigue and flexible morals. The true monsters are not the giant insects that stalk the wild world of Erde, but the beasts who don the mask of civility to cover their crooked convictions. To ask other readers questions about Imperium Lupi, please sign up. Am I getting soft with all these 5 star reviews this past month or so? No, I've just been exceedingly fortunate. This was my first anthropomorphic book since I was a kid obsessed with Redwall. Its premise and good reviews intrigued me but I was a bit stand-offish due to my usual suspicion on steampunk settings. I need not have worried. What 'Imperium Lupi' actually contains is some of the best world building I have ever come across. Fictional racial, regional, political, and class tensions come t Am I getting soft with all these 5 star reviews this past month or so? No, I've just been exceedingly fortunate. This was my first anthropomorphic book since I was a kid obsessed with Redwall. Its premise and good reviews intrigued me but I was a bit stand-offish due to my usual suspicion on steampunk settings. I need not have worried. What 'Imperium Lupi' actually contains is some of the best world building I have ever come across. Fictional racial, regional, political, and class tensions come to the fore in a believable way in a setting as original and creative as any. The plot is complex and I don't give spoilers so I will speak in the broadest of terms here. There is moral ambiguity and Machiavellian maneuvering. What is unique here, however, is the capturing of the powerful actors on all sides as both scheming and three-dimensional. Some of the most ruthless characters have very admirable qualities, and the more innocent characters sometimes let you down. This level of balance-while maintaining a healthy gray zone around most actors, is what makes even this fantastical setting so believable and worth investing in. One warning for the sticklers out there, there are sound effects aplenty and an unfortunate tendency for inner dialogue to merge with third person narrative in a way that might make you do a double take at first, but you get used to it. Personally, such things don't really bother me. I am normally not a person who likes series style fiction, but there were enough loose ends in such a thoroughly detailed setting that I can't help but suspect a sequel could, one day, appear. I would certainly read it were such to be the case. I too want to know what lurks in those dead cities. To be honest, I did not pick up this book with great expectations. Even as a fan of anthro characters, I imagined it would be another entertaining if hollow fantasy adventure to pass the time; a forgettable book. I’m very happy to say that I was completely wrong. 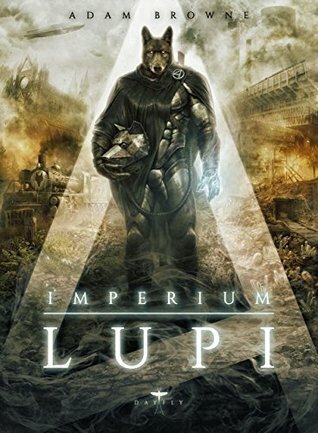 Imperium Lupi is an incredible book that is definitely worth your time. I usually split any novel into different components to try and analyze it better, so here it is. Plot: 9/10. I don’t remember the last time I read a book that handles so many storylines so well. There were moments when there might have been 5 different narratives going on, each following different characters and events, and each engaging and thrilling in their own way. There’s exciting action, complex intrigue, subtle romance, painful suspense and more. It is not easy to keep track of everything, and I sometimes had to backtrack to remember a certain event, but this is a compliment more than a criticism. I can imagine the amount of planning that must’ve gone into every single one of those storylines and I congratulate the author for it; I never would’ve been able to pull it off like he did, even if I felt lost occasionally. But again, the blame is mostly on me. Characters: 9/10. Although there are heroes and ‘villains’, most characters are complex and end up doing questionable things for certain goals, even the most heroic. There’s some delicious grey morality that makes it almost impossible to label a certain character as ‘good’ or ‘bad’, and I love it (my favorite example of this is Janoah but I won’t say more!) Even the ‘villains’ willing to commit horrible deeds have understandable motives that fuel their hatred. With such a complex story I can’t even tell if there’s a real protagonist, multiple, or none at all; but that just adds to the novel’s originality. Every now and then I had to question a certain action by a character, wondering if maybe there wasn’t a simpler or safer way to reach an objective, but those instances were very rare. Setting: 10/10. The world of Imperium Lupi is dazzlingly exotic, yet relatable and familiar. Even with giant insects, anthropomorphic animals, and almost-magic abilities, there are parallels to the environmental destruction, racial tensions and inequality that we know so well. After 720 pages I still crave more of this world, its history, religions, etc. Is it fantasy, sci-fi, or steampunk? Even though these tags give an idea of what Erde is like, in reality, it’s an original blend of these elements that feels surprisingly realistic without losing its fantastical appeal. Writing: 8/10. Overall, the author tells his story very well. I could picture the characters, their actions and the world without much ado, and there are a handful of great quotes and passages. Nonetheless, there was some room for improvement in my opinion. I’m not a big fan of literal sound effects nor exclamation marks in an omnipresent third-person narration, but that’s my personal taste. In my kindle version I counted a total of four typos in the whole book. Considering this is all self-published I won’t be a jerk over it; we all make mistakes and it’s easy to oversee them. At the end of the day, none of these things spoiled my enjoyment in the slightest. First of all: I am Reaaally a picky reader. Till now NO book I have read , and I read a lot , has ever gotten 5 of 5. Second: I usually do NOT read book with Anthropomorphic Animal Characters. Okay, I have read a number but most of them were of the same nature and I did not like them. This one here is different. It has not only a giant set of characters . It also has a big number of background and far more stories untold. Which alone is great. I could tell you more but I fear I woudl spoil it. S First of all: I am Reaaally a picky reader. Till now NO book I have read , and I read a lot , has ever gotten 5 of 5. Absolutely amazing read. Well described characters and well-written storyline. I recommend this to everyone that asks about it, and many that don't. Imperium Lupi is one of the best books I've ever read. Probably one-of-a-kind. The view of the story is unique and great. I like how the characters become 'unknown', when it goes to the view of another character, like how Janoah is first offered as 'red wolfess' first, in Olivia's view. And I like how most characters are dynamic, showing that they act as antagonists, but are actually protagonists, or the other way around. That makes the story thrilling, in the view of not knowing who to trust. And I can definitely see the anime-like elements, like Rafe (LMAO) and Uther and Linus under the cherry blossom. It all sums up to a story that not only furries will love, but almost anyone. And you might have heard this before; I like how they have a definition of HANDSOME. But the biggest thing that actually moves me, is the environment of Lupa. How polluted it is, how it rains ash almost every day (R.I.P WHITE GAITERS AND GRAND HOWLER CLOAKS AND WHITE-FURRED BEASTS). It reminds me of what might happen to our world. Something similar to the Ashfall can happen to us, only without the whole 'rot' thing. But even excluding the rot, the effects of pollution can make our life hard if not miserable and suffering. That's why kids, keep the streets clean green. An absolutely intriguing world fueled by a well written and well paced plot, this is without a doubt the most entertaining book I've read in years. Being a fan of both steampunk and fantasy (though not high fantasy), but generally not one to read books of those genres, the brief description piqued my interest. This led me to discovering the author's supplementary works and drawings online, where I became absolutely engrossed by the world details and character designs. Deciding to give it a shot, An absolutely intriguing world fueled by a well written and well paced plot, this is without a doubt the most entertaining book I've read in years. Being a fan of both steampunk and fantasy (though not high fantasy), but generally not one to read books of those genres, the brief description piqued my interest. This led me to discovering the author's supplementary works and drawings online, where I became absolutely engrossed by the world details and character designs. Deciding to give it a shot, I picked up the book, and a few days later, here I am, with absolutely zero regrets. Other reviewers here have gone into details of the premise of this novel and have said pretty much all I wanted to say, so I won't be getting into even more details to avoid spoilers. But I've got to say, this novel is splendid! Although Imperium Lupi's target audience are fans of anthro fictions, it is an amazingly well written steampunk fantasy adventure that any teenager as well as anyone of older age groups can enjoy. Although I should mention that readers that aren't used to third person omni Other reviewers here have gone into details of the premise of this novel and have said pretty much all I wanted to say, so I won't be getting into even more details to avoid spoilers. But I've got to say, this novel is splendid! Although I should mention that readers that aren't used to third person omniscient narration may find it a bit disorientating at first, but you'll learn to get used to it quickly. Better yet, you'll learn to enjoy it quickly as well because reading this novel is like watching a good movie. The author has an amazing writing style and it is easy to visualise the scenes as you read along. Adam Browne lives and works with his partner in Kent, England. Besides writing, his other pursuits include natural history, human history, futurism, and blocky old video games.